Gotta love this grind man. Blake gives us a next look at what it’s REALLY like out on the road hustling this music thing. Blake C gives us a nice look at his recent trip to Japan. Part 2 (of Part 1) under the hood! Preeeety crazy to see all these artists on their grind back then. Shouts to Mauricio for passing this along! A passionate group of up and coming directors, artists, and community leaders embarked on a musical journey. The goal: to throw down the realest rap show the city had ever experienced. The goal was accomplished. Held at Toronto’s legendary concert venue The Reverb, 4 cameras captured the entire thing. From the soundcheck, backstage, to the gathering crow at the door, we see everything, and get a very unique glimpse of Toronto at a very special time when Hip Hop was really Alive in the city. Peep the rest of this previously unreleased documentary after the jump! Earlier this year the CBC put together a Hip-hop Summit to pay homage to Toronto and Canada’s on-going hip-hop legacy. 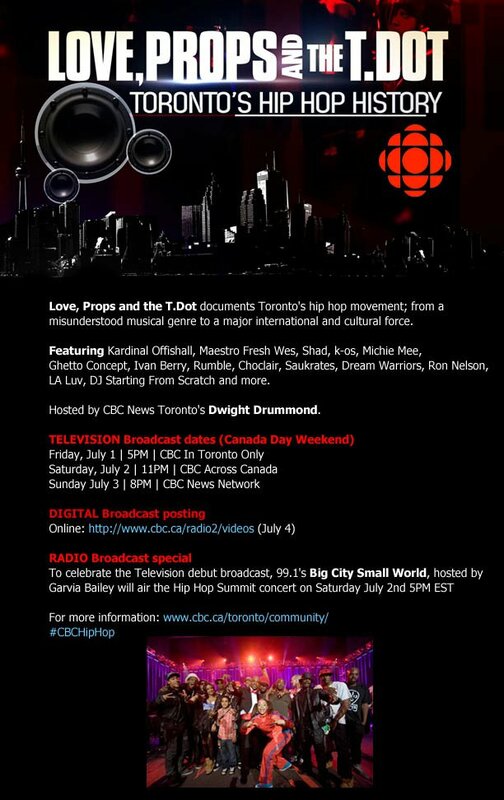 Tomorrow (Canada Day) @ 5pm on CBC Toronto will be presenting a documentary – “Love, Props & The T.Dot: Toronto’s Hip Hop History” – that incorporates footage from that show, along with interviews from some of this city’s legends – to tell a bit about a story we’ve all lived – but have never seen televised nationally. Big shouts to all the people over at CBC and in this city that made all this possible. Salute. Fantastic Voyage, LA Luv, k-os and more. An inspiring short doc on come-up kid and 2010 Remix Project graduate Chris Pics and his attempt to chase his dreams as a photographer. Pretty dope trailer for an upcoming mockumentary called “Know Your Rights”, producedby Jane-Finch.com founder Paul Nguyen with music from The Smugglaz. Screening takes place this Friday (May 21st). Check the details below. Know Your Rights is a public legal education film(with unreleased and official Smugglaz music) that aims to provide people, and particularly youth in at risk environments, with: basic information about their rights when dealing with police; an understanding of powers of arrest, detention and search; strategies to deal with various situations relating to police contact; and an understanding of the recourse available when someone experiences an abuse of police power. Free admission, free parking available onsite.